Imagery is a powerful thing. Even though I pour my passion into spinning words, my stories play out in my head like movies. I see scenes as I write them. As added inspiration, I surf the net looking for actors or models who resemble my lead characters. I print out those pictures (adding my character's name) and tack those to my bulletin board. I glance up at them when I'm writing dialogue, imagine those words tripping off their tongue. or not. I refer to them when I need to write physical descriptions. As I scanned a stock photo site, all I knew is that I'd know Zoe and Gabriel when I saw them. It didn't take long and I didn't even second guess myself. The thing that's slightly different about this story is that most of the locations are . . . let us say . . . otherwordly and atmospheric. For the first time ever, I needed a visual for a place. My husband had a calendar featuring photography of Simon Marsden. The topic? Haunted Realms. I saw several photographs that captured my eye and imagination. 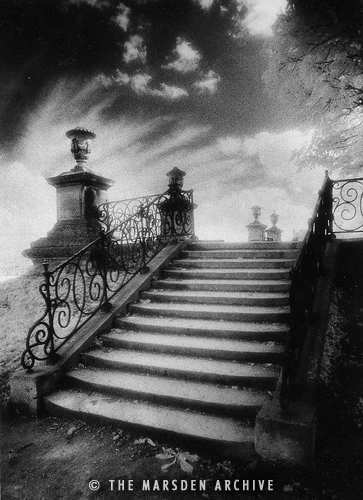 And this is a photo that resembles one that I chose as inspiration for Blackmoor Manor. Treat yourself and visit Mr. Marsden's website. The photography is mesmerizing! What about you? Are you inspired by imagery? I just went to his site. Amazing! And I love the looks of your characters. I see almost a story in their faces and the way they stand. I'm sure you'll find that story. Great post Beth. I love you images. Especially the one of the "portal." I can tell this is going to be an amazing book!! I can't wait! Imagery is very inspirational. It can also be calming and uplifting. Hi Edie! 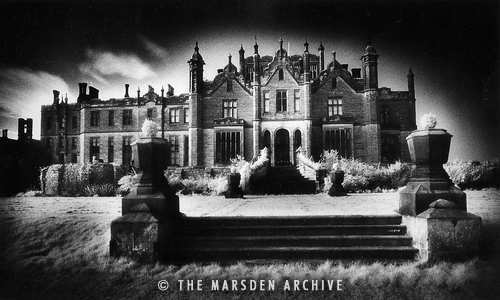 Isn't Marsden's photography amazing? I'm so glad you checked out the site. Maybe you can find inspiration there, too! And I love what you said about my character pics: 'see the story in their faces'. That's how I felt! You're right about imagery also being uplifting and calming. I have a few such paintings in my bedroom. For those of you wondering where the heck Barb/Elle has been, she just notified me that her Internet has been down for three days! As you can imagine, it's driving her nuts. But she'll be back. Hopefully tonight!! The pictures are amazing. I love them. I often get ideas for my poetry from pictures. I might have to use some of Marsden's as inspiration. Wow! Those pictures are amazing! Can't wait to visit his site to see more. Beth, I am when writing otherworldly. You need some physical things like houses, trees, forests, rooms, to add to your imagination. Now I have to say, while I don't normally think of actors or such for my characters, while looking at an Avon catalogue me niece left me months ago, I saw a young women in there and went, omg, that's Raine. Very cool. I haven't found my hero. He's sort of a conglomeration of a couple of men I know. But I've kept my eyes out for *him*. Tori, enjoying the paranormal as youdo, you definitely need to skin his whole site. You'll be mesmerized! I have to say this was the first time I used non-celebrity types for my character images. In a way it's better because you don't have preconceived notion of personalities. I too can be very moved by the right image. If I'm reading a novel my mind will fill in images of what I'm reading and it adds to the overall experience. I love Marsden's website!